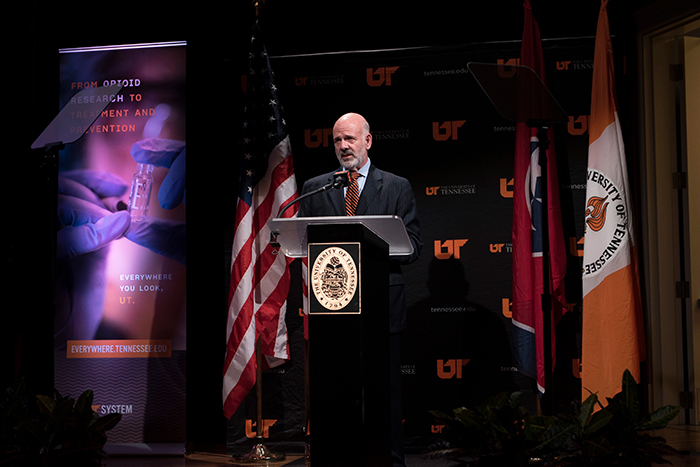 NASHVILLE, Tenn. – The University of Tennessee – with its unique capacity to provide education, conduct research and deliver outreach to every corner of the state – is turning its combined capabilities to the opioid crisis, President Joe DiPietro said Feb. 28. From conducting research on opioid addiction to proposing public policy and developing preventive education to creating new treatment protocols, in the opioid crisis, UT experts are working to solve one of the state’s challenging problems. After highlighting successes of the past year in each of the university’s three mission pillars—education, research and outreach—DiPietro shared a video capturing UT’s work to apply all three to combat the opioid crisis. The UT Health Science Center’s Center for Addiction Science, the first of its kind in the nation, provides treatment, conducts research and delivers education and community outreach. The UT Institute of Agriculture’s Tennessee 4-H program “Health Rocks” teaches young people from nine years old and up about legal and illegal substances. The Institute for Public Service’s Law Enforcement Innovation Center provides law enforcement training on administering the medication Narcan for emergency treatment of opioid overdose. UT resources and strength are the products of the university’s three-part mission to provide education, conduct research and deliver outreach. They’re also part of being a land-grant institution—a designation the university has had since 1852 as a result of the federal Morrill Act, DiPietro said. With that law, UT joined other public universities across the nation in opening higher education to all, instead of only the elite. “Research—what I call the ‘discover’ part of our mission—we do to a greater extent than every other public higher ed institution in the state—combined,” DiPietro said. A video showed how one focus of UT Knoxville research deals with enhancing national security by using drones to find radioactive sources, while another demonstrates the importance of a multi-disciplinary approach to improving society by studying the rise and fall of social institutions. After noting three consecutive years of holding tuition increases to 3 percent or lower, DiPietro vowed it will happen for a fourth year in 2018. He also said university efficiency enhancements and cost cutting have achieved $15.2 million in savings in recurring funds. Enrollment has climbed and even broken records on some campuses, while the freshman-to-sophomore retention rate averages 81 percent system-wide. Graduation rates also are rising at every UT campus. The video on education showed how UT helps its students – whether veterans or those who work with veterinarians — succeed. At UT Chattanooga, a Veterans Entrepreneurship Program helps those with military backgrounds translate their skills to the business world, while at UT Martin, an online veterinarian technician program helps students move from an associate’s degree to a bachelor’s degree. Another video demonstrated how the Law Enforcement Innovation Center provides active shooter training to law enforcement officers, while the UT Institute of Agriculture helps farmers with changing their practices to improve water quality, which enhances their livestock profitability. For more information, contact Gina Stafford, assistant vice president and director of communications for the UT System, at 865-974-0741 or stafford@tennessee.edu. PHOTO ID: UT President Joe DiPietro is shown delivering his third annual State of the University address Feb. 28 at the Nashville Public Library. Photo by Jed Dekalb.